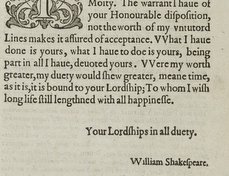 This diary entry, written by Richard Stonley on Tuesday, June 12, 1593, records the first known purchase of the first edition of Shakespeare's first printed work, the narrative poem Venus and Adonis (London, 1593). Only one copy of this edition is now known to survive; it is housed at the Bodleian Library. Stonley, one of the four Tellers of the Exchequer of Receipt (the four officers charged with receiving and noting incoming revenue to the Exchequer and depositing it in the Treasury), kept daily diary entries that indicate a pious and hardworking man who structured his day around work and prayer. The brief entries generally included his activities, moral advice in the form of biblical and classical passages, and daily expenses. He made frequent references to his immediate and extended family, mentioned the names of his minister and other friends, and occasionally recorded public events. Stonley purchased Venus and Adonis less than two months after it was was entered into the Stationers' Register on April 18, 1593. The entry for June 12 follows the same format as most other entries. On the day he purchased Venus and Adonis, which was St. Basilides' Day, his daily aphorism was the second distich (a couplet, or 2-line stanza) from Book 4 of the Distichs of Cato, which he transcribes in Latin and in English. While in London, he spent ten shillings on "vittell" (victuals), three shillings, twelve pence on apparel, and twelve pence on two books: Venus and Adonis (London, 1593) and John Eliot's The Survey, or Topographical Description of France (London, 1592). On the next page, he records further expenses for victuals, and summarized his activities: morning prayer, reading during the day, and thanks to God at night. He dined with Mr. Puxley and supped with Anne Tomlyn. The price that Stonley paid for Venus and Adonis interests scholars, but it is unclear whether he purchased these two volumes bound together or separately, and if separately, what the price of each item was. In some cases, when Stonleys records in his diary that he bought a book "with" another book, he clearly means that they were bound together in a single volume. Other books bought "with" each other are of different formats (octavo and quarto, for example) and so would not have been bound together. Both Venus and Adonis and the Eliot book were quartos, so either interpretation is plausible, and the exact price for Stonley's copy of Venus remains a mystery. The Folger Shakespeare Library holds three volumes of Stonley's diaries, from 1581/82, 1593/94, and 1597/98. The last volume was written in London’s Fleet prison, to which Stonley had been sent in 1597 when he was convicted of embezzling more than £12,000 from the Exchequer over the course of his career. 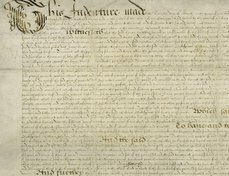 The Crown seized the contents of Stonley's London house to defray his debts, with the inventory of his goods listing more than 400 books (the inventory is in The National Archives). Stonley's copy of Venus and Adonis does not survive, but other books of his do. For example, the Folger Shakespeare Library owns his copy of Bernardino Ochino’s Sermons (1570) (FSL STC 18768). Stonely's diaries were known as early as the late eighteenth century. The Venus reference is first mentioned in a May 7, 1794 letter from Francis Douce to George Steevens (Folger Shakespeare Library, MS C.b.10, no. 66). In 1796, Edmond Malone refers to the Venus entry on page 67 in An inquiry... (London, 1796), and it is noted in the fifth edition of Samuel Johnson and George Steeven’s The plays of William Shakespeare (London, 1803), revised by Isaac Reed, in vol. 2, p. 162. The diaries passed through various private hands for the next century and a half, largely out of sight of scholars. The second volume, with the Shakespeare reference (Folger MS V.a.460), has the 19th century bookplate of John Adair Hawkins (1757-1842). In the nineteenth century, they were apparently sold by booksellers James Rimell & Son, as item 547 in a (currently unlocated) catalogue. The first volume (Folger MS V.a.459) has the bookplate of William Niven (died 1921), FSA, ARE, of Kingwood, Berkshire, Marlow Place Library. 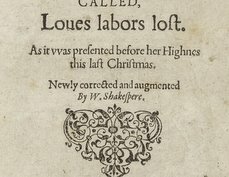 In 1972, the Folger purchased the three volumes from the Palo Alto, CA bookseller William Wreden, when the Venus entry was "rediscovered" by Folger curator of manuscripts Laetitia Yeandle. 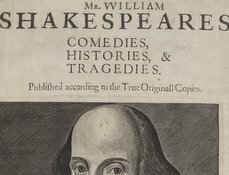 The Folger announced the discovery in a press release on Shakespeare's birthday in 1973. This day after morning prayer I kept home at my books, with thanks to God at night. Strangers at dinner Mr Puxley at Supper Anne Tomlyn. very hurtfull to vertuous and honest maners. at home at my bookes with thankes to god at night. Puxley at Supper Anne Tomlyn. Additional contributor to description: Jason Scott Warren.